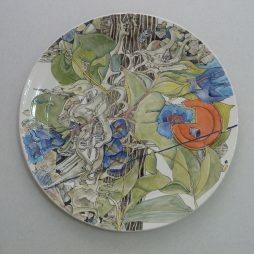 retirement in 2006 in order to concentrate full time on making decorative ceramics. 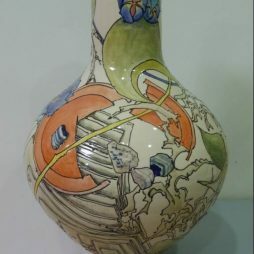 in the 1990s he developed an interest in the tube lining decorative technique used in late 19th and early 20th century tile making. One of his early tile panels was included by Lark Books in “500 Tiles” published in 2008. In the early 2000s Peter began to translate his tile designs into 3D work on thrown earthenware pots. The majority of his pieces are now thrown bowls, vases and plates but he also occasionally produces panels using commercially made bisque tiles as a base and, less frequently, some slab built items. Plates range in size to approximately 54cm in diameter and the larger ones are generally supplied ready to hang on a wall, although the hanging system has been designed by Peter to be removed easily if required. Peter is a Member of the Royal Birmingham Society of Artists and a member of the Midlands Potters’ Association and the Scottish Potters Association. Having relocated from Staffordshire in early 2011, he now works from his studio at home in Whithorn in the beautiful Machars area of Dumfries and Galloway.